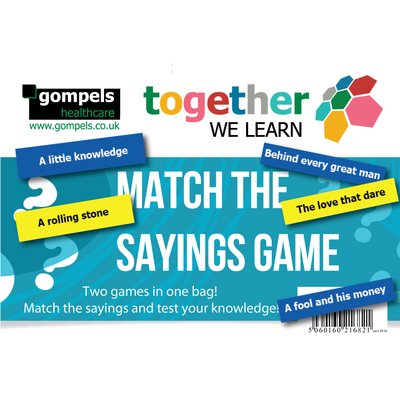 Developed in-house and using years of expertise, our Match The Saying Game is a great addition to your care home's recreational room. This simple game offer a gentle challenge for those dealing with dementia and is suitable for either single players or groups that with to interact. Playing on that traditional game of snap, each saying has been split into two halves and shuffled in the durable cardboard box. Simply match the saying and relay what you see. Unlike traditional games, there are no rules or instructions with the entire game styled using colours that are dementia friendly. Each saying has been picked from popular culture and offers a great way to encourage conversation and evoke pleasant memories. We also stock a range of entertainment items that are perfect for the care home environment such as our Touch & Match Board.